A brand new dino-mite adventure! Dare to experience the dangers and delights of Dinosaur World in this interactive new show for all the family. Grab your compass and join our intrepid explorer across unchartered territories to discover a pre-historic world of astonishing (and remarkably life-like) dinosaurs. Meet a host of impressive creatures, including every child's favourite flesheating giant, the Tyrannosaurus Rex, a Triceratops, Giraffatitan and Segnosaurus, to name a few! Following a hugely successful national tour last year, including a smash-hit summer season at London's Regent's Park Theatre, DINOSAUR WORLD LIVE is back due to popular demand. Dinosaur World Live website. Performers Lucy Varney (Miranda), Romina Hytten (Puppeteer/Understudy Miranda), Darcy Collins (Puppeteer/Puppet Captain), Gary Mitchinson (Puppeteer), Peter Twose (Puppeteer), Emily Cooper (Puppeteer/Pullet Technician). Author Derek Bond. Producer Nicoll Entertainment. Director Derek Bond. Design Max Humphries (puppet design). Director Laura Cubitt (puppet director). Other Max Humphries (puppetry consultant). Design James Perkins. Costume James Perkins. Lighting John Maddox. Sound Tom Mann. Between 17th April 2019 and 1st September 2019 this tour will visit 23 venues in Northampton, Newport, Eastbourne, Spalding, Chesterfield, Weston-super-Mare, Colchester, Grimsby, Stockton-on-Tees, Coventry, Lichfield, Newbury, Horsham, Harrogate, St Helens, Wolverhampton, Lincoln, Hexham, Inverness, Lanark, Nottingham and Outer London. Current and future dates only. This production has already been seen in 11 venues since 12th March 2019. You can embed this tour information on your own website by adding a single line of code to a page and using the Qtix code T200891629 - for details see our Embed Information page. 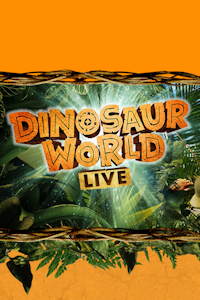 Receive email notifications of changes to Dinosaur World Live.